Looking to enhance your exterior and add curb appreal? A-One Siding & Seamless Gutters has over 20 yrs. Commercial and Residential experience. We are licensed and fulling insured. We serve Central and Western Michigan. 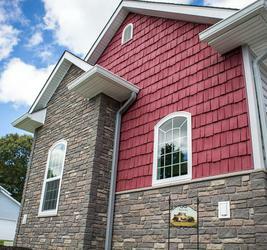 We specialize in home exteriors from Roofing, Siding, Trim, Specialty Masonry and Cedar Vinyl Sidng & Gutters. Our mission is to offer our customers cost efficient products with high quality and honest workmanship. Let us help you protect your largest investment, your home. We use products from the top manufacturers in the industry. Contact us for more information on the endless options available. All of our products comes with a lifetime warranty from the manufacturer.